Given all of the feeding (overfeeding?) that goes along with birthdays around here, I thought that a simpler supper was called for last night. 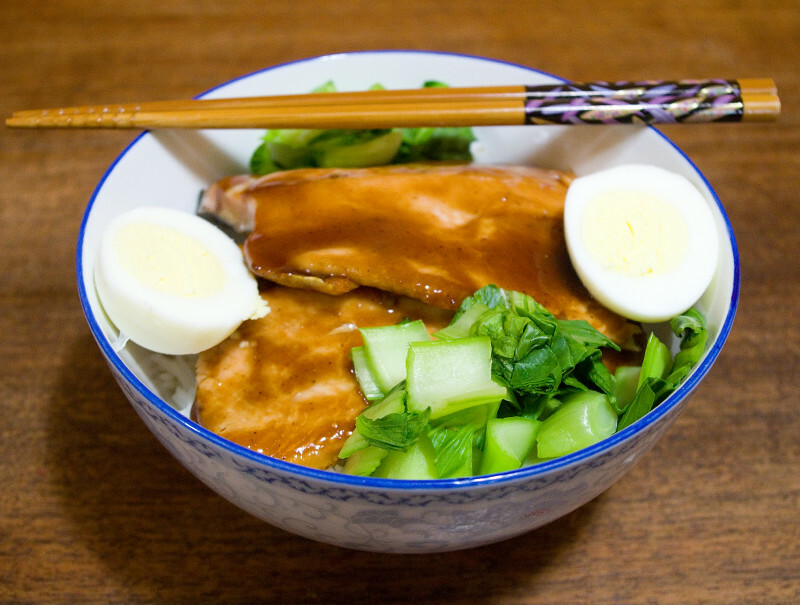 Luckily, rice bowls are a family favourite (which you’ve probably noticed if you’ve read through my older posts), and teriyaki trout is something the kids ask for anyway. Well, they ask for teriyaki salmon, but trout is a fraction of the price, and they’re almost as happy with that. So I cooked up some basmati rice, baked trout fillets with teriyaki sauce, steamed some bok choy in the microwave, and served it all with leftover hard boiled eggs from the fridge that had to be eaten up. That particular batch of eggs had spectacularly pale yolks, by the way, despite tasting nigh on identical to darker-yolked eggs.